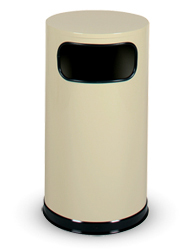 Ideally suited for upscale indoor environments, these fire-safe steel trash receptacles feature protective vinyl trim all around disposal openings and a non-corrosive base ring to protect floor surfaces from scratching. 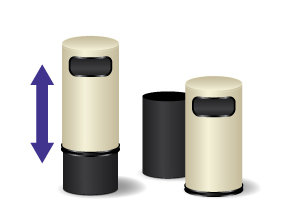 The exceptional durability of the smooth powder-coated finish provides a low maintenance solution for prominent areas. Convenient lift-off top makes it easy to empty the galvanized liner underneath and keeps the liner out of sight. 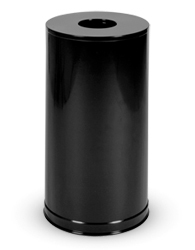 Matching black ash urn, 3.5 gallon ash/trash combination unit, and 5 gallon waste basket available. California State Fire Marshal Listed. Lift-off receptacle for easy emptying!